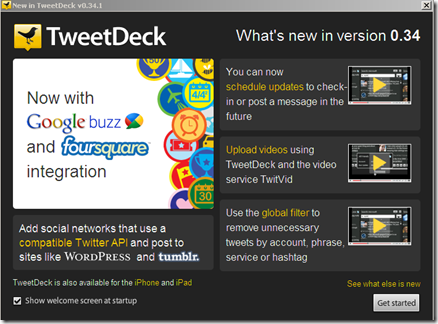 TweetDeck is an amazing desktop Adobe AIR app for Twitter. But, it has been adding support for other social networks as well making it a one app to have in your desktop to access all your social network accounts! Google Buzz support – One of the first clients to offer desktop client for Google Buzz. You can post to buzz with no character limit and also include your location data. You can comment and like your friends’ posts. You can also mute conversations to focus on just a few people. FourSquare support – FourSquare is one of the popular ‘check-in’ location based services. Now, you can use TweetDeck to check-in, find your friends, see tips and current visitos on Venue profile pages. Location support – Find yourself on a map and add location information to your tweets. Schedule updates – this is the biggest feature for me. You can now schedule your updates!! Support for other APIs – TweetDeck now supports other major APIs for updates such as Tumblr, WordPress and StatusNet. Custom URL shorteners – You can also add your own custom URL shorteners with the new APIs. TwitVid – Support for video uploads using TwitVid. You can even record with your webcam and post it to your update. Global filters – hide those annoying auto updates from your otherwise lovely friends. TweetDeck was an awesome desktop social network client before and it just became even more powerful in my eyes! Here is the full changelog of all the bug fixes and new features in this latest version. TweetDeck is also available for iPhone & Apple iPad.